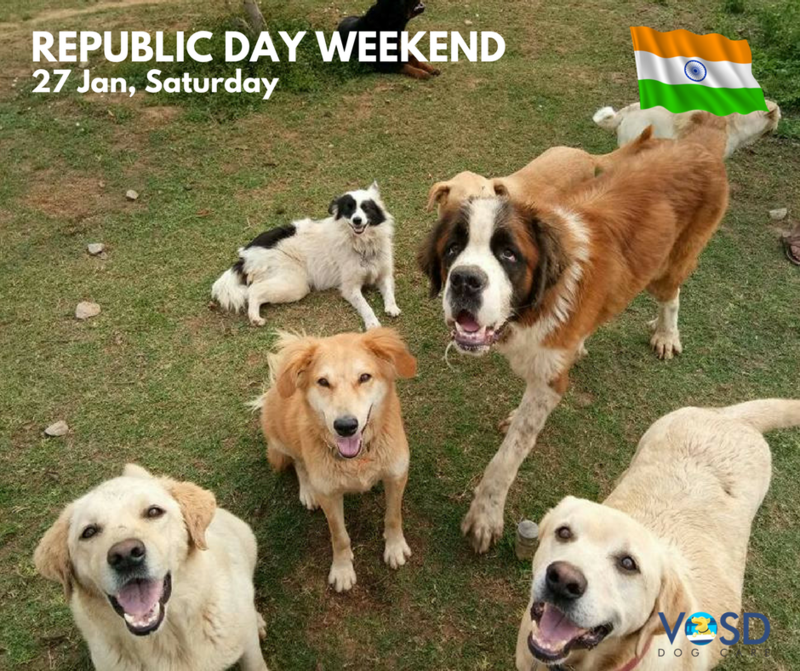 REPUBLIC OF DOGS: VOSD FARM DAY™ booking form - VOSD Rescue Store I Support the largest dog rescue in India & the largest in any city in the world. WHO IS THIS INVITE FOR? This is a one-person invite for you only, and cannot be transferred. If 2 pax are coming then QTY = 2 when you check out. Only adults (18+) who are comfortable with dogs will be allowed inside the Sanctuary. Even for people familiar with dogs, the number can be quite overwhelming. Safe to say that you would never have seen so many dogs in one place before. The dogs are in enclosures according to personality types. No dogs are chained or tied. But there are also a large number of dogs – at least 150 – who are out in the open (what is called Enclosure #0) and they express love by jumping on you. Recommended clothes: Jeans, old Tshirts, sneakers. There will be dogs who will want to play, and it’s quite possible you may get scratched — long sleeves/ jackets are a good way to avoid that. Do carry soap and a towel because you will get muddy. There’s facilities to wash up, and toilets. You understand that you are responsible for yourself and those accompanying you. Once you sign up we will request you if your choice of lunch will of Veg or Chicken Biryani, and Soft Drinks or Beer. Please book your visit for the Republic of Dog here. Please send a mail to info@vosd.in with your reference number to indicate your choice of food and beverage. This an 80G contribution for which you will receive a receipt. 100% of the proceeds will go towards the dogs you see on the day. This is a good time to see not only the expanse of the facility but also the expenses in building facilities and operations costs of taking care of the dogs at the VOSD Sanctuary. We hope you enjoy it! The Voice of Stray Dogs or VOSD is a 5 year-old non-profit that is already the world’s no-kill dog sanctuary and rescue. With ~7500+ rescues, 250,000+ treatments, 750+ resident dogs, we have experience caring for dogs in every kind of distress. VOSD infrastructure and processes have been built on a $2 Million/₹12 Crore budget, largely privately funded. strays.in is the largest website in the world for dogs, and VOSD has a considerable online presence, with ~100,000 followers on FB+G+, and 12-13 million views on our website + FB + Google+ pages. The VOSD Sanctuary is a magical place. It is subject of many articles and photo stories, it’s the place that 750+ rescued dogs call home! While the 750+ dogs that live with here been featured many times in CNBC, NDTV, The Hindu, Hindustan Times, Time of India, etc. a month back we were covered by the BBC which went viral with in excess of 6 million views on the BBC, The Logical Indian, IT Matters, CNN, ScoopWhoop publications. This is a place where each dog has a name. All dogs are free within their 30+ enclosures in a 3.5 acre area. Each enclosure has an enclosed ‘indoor’ as well as an open area, lined with trees. The enclosures have heaters during the winter, and individual water bodies for the dogs to jump into and cool off, in summer. There’s also a 1/4 acre artificial lake created for the dogs simply called ‘the swimming pool’. The whole Sanctuary is lit on UPS throughout the night. We have all medical facilities and supplies in-house.